As I get closer and closer to my goal of running marathons in all 50 states, I am starting to come upon those states that only have a few races each year. Running doubles saves a bunch of money, but sometimes you just have to pony up and make a trip for only ONE race, and you don’t get to choose when it is. This was the case of my 38th state, Vermont. I actually flew into New Hampshire (avoiding Boston area) and drove ~2.5 hours NW to Burlington, Vermont. The road trip was beautiful, and it reminded me of why I love this part of the country. Late May and all the tress were in full summer glory, rolling hills (the call them mountains here) as far as you could see. Because it is not really flat there are very few farms, just green everywhere. As well as the sheer beauty of this whole area, the people are very kind and sweet. Laid back, and liberal. I felt very comfortable here all weekend. If I could pick it all up and move it south 500 miles (for less harsh winters) I would retire here. The Vermont City marathon has been around for a long time, and so they know how to run a race. The expo was actually pretty cool, and I had to break down and buy a pair of running socks because I forgot mine (first time in 40+ marathons I forgot my socks) and checked into the hotel and went over to check out Lake Champlain before dinner. The lake is gorgeous, separating Vermont from upstate New York. It reminded me a lot of Puget Sound, it was that scenic. Race morning went as usual, nothing exciting and due to the size of the race I arrived at the start/finish area 1.5 hours before race start to get a good parking spot. The forecast had been for crap, with 40% chance of thunderstorms and a projected high in the mid 80’s. The night before, everything changed. At race start, the sky was overcast, temp in the mid 50’s and it would only get to the high 60’s before I finished. The sun did come out at about mile 10, which slowed me down a bit, but not too much. As usual, I did not train for this marathon per se, so I had no idea how fast I could run it. I started out fairly fast, running 6:45ish pace the first 10 miles. When I hit the half way mark in exactly 1:30, I knew I could not hold that pace to break 3 hours. With that possibility out, I just had to stay under 3:15 so I could still get my 8 points for this race in my 50sub4 marathon club quest. As such, I slowed down to a comfortable pace and decided to enjoy the run. I am a ‘trainer’, not a ‘racer’ and I know that. I am mentally weak when it comes to racing, and I have always known that. If I could get over that, I could break 2:50 again, but who knows if I can ever do that. I run as well as I do simply because I have trained my body to run in the 7-7:15 pace range comfortably for hours. Put simply, I race well in spite of my mental weakness because my body can do it without use of my brain. The people of Burlington really love us marathoners. They were out in force cheering us on, not just because we brought of munch of tourism dollars to the area. The volunteers were numerous and enthusiastic, and it reminded me a lot of my recent race in Lincoln, NE. The only thing this race had that Lincoln did not was the views. At several points during the race we got nice views of Lake Champlain and all its beauty, it was awesome. The finish was really cool, as we were put on a path that had snow fence on both sides, but spectators lined up on both sides. A six foot path lined for 400m by people cheering you on. The winners had come in almost an hour earlier, but the crowds were still there cheering us on as if we were winners. Lots of food, including some Ben and Jerry’s ice cream (This is Vermont after all) and I headed back to shower and get ready for my drive back to New Hampshire. Another beautiful drive south to Manchester got me there in time to catch a movie before dinner at an EMPTY sports bar in downtown and then a good night sleep at a very nice hotel (Thanx Hotwire!) and then my trip home. The distinct memories of this trip would have to be the wonderful views and the kind people. A nice happy run. Thanx Vermonters!!! I know, I know. What’s a guy who just last month ran 101 miles in 20 hours doing running a local 5K? Well, it’s because I need the speed work. Truly. In the last 6+ months I have been focusing on getting my mileage up to consistently over 100 miles per week. That involves day after day of 10-15 mile runs at a comfortable pace, usually around 7:30-7:40ish. I have never liked speedwork (usually defined as something like half mile repeats) even when I was racing 5Ks in my younger days. And now that I am an ultramarathoner, I really hate them. But, if I want to be competitive, no matter what the distance, sometimes I need to get my leg turnover going. I should do tempo runs as part of my training, but I just don’t like them. So I needed to register for a short race (5K for me is considered short) to force me to run fast. I am mentally weak when it comes to races, but I do get ‘up’ for them, so I decided to sign up for this one. Jackson has a good choice of local shorter races (about 1/month), but amazingly I am usually out of town (doing marathons) or busy on those race weekends so when I can do them, I try to. I have been doing runs with a former student/ JCC cross country runner, Joel, and it was he who convinced me to enter the race. Sure, what the heck I said, I need the speedwork. I found him at the race and a few other former cross country runners and we did a ~2mile warmup, I did my stretching, etc. Ya know, what real runners do. This race has one wrinkle, the start time. Most road races are on the weekend starting at 7-9 am. This race is held every year on a Friday night at 7 pm. Pre-race preparation is always weird because it is so different with the night start. I did my best. My bride-to-be Misty was in town for the weekend and she joined me, her doing the 5K walk. This was the 4th event we have done together, and it reminds me each time of one of the many reasons why I love her as much as I do, she supports my running addiction with her own passion for fitness. We are planning on doing another joint event the day after our wedding, officially starting our honeymoon. That says a lot, I think. The race started and I ran with Joel for the first mile, coming in at exactly 6 min. I felt pretty good, but knew I could not hold that pace for much longer. Mile 2 was at about 6:10, and mile 3 a little slower. I ended up beating Joel, which made me feel good since he is a one of the better CC runners at JCC. After I finished, I grabbed a sub sandwich (from Southside Super Deli, yum!) and hid it (I thought they would run out quickly) and then did a cool down going backwards on the course to catch Misty. Once I found her, I walked with her the rest of the way. We grabbed her a sandwich and headed home after another good race. What was really great about this race is that it shook off a lot of rust. It had been literally months since I ran at 6 min pace and it had a noticeable effect starting the next day. Instead of doing my 10-12 mile runs at 7:40 pace, I was doing them at 7:10 and feeling great. My speediness only lasted about a week, but it was enough to convince me that I need to do more of these, just for the workout. One last point. No matter what I seem to do, I finish in the top ~5% of every race I enter, no matter what the distance. From 5K’s to 24 hour ultramarathons and every distance in between. I don’t seem to be really awesome in any of them, just pretty darn good at all. Considering I just got back into this sport for health reasons and not for competitive reasons, I am pretty happy with that fact. Well, this was a totally different experience than the race I ran, just 24 some odd hours before. So I got into Omaha (1.25 hours away from my hotel) at ~10pm the night before the race, which is never a good omen, especially because I was tired as heck and only got ~6 hours of sleep the night before. This was the 33rd annual National Guard (Guard troops from all over the country running which was awesome to see, especially me being a National guard vet) Lincoln Marathon , so the entire operation was a well oiled machine. The town of Lincoln really supports this race. I heard the figure of 2000+ volunteers (for 5000+ runners), all of which were quite happy to help us runners out. Always smiling, cheering us on, it was awesome. The aid stations had something I have never seen before in my entire racing career, many of the water/Gatorade cups having lids and straws. Very labor intensive, but boy, did it make drinking while running so much easier it was so awesome. Weather was perfect, 45 degrees and no wind at race start, and I think it was maybe hit 55 by race end. You could not ask for more perfect marathoning weather, trust me. A total and complete different marathon than the one I ran yesterday. After a nice jog, the finish line was the 50 yard line at Nebraska Stadium (ya know, where the Cornhuskers play) which was cool. My first two ever marathons, Sunburst and Detroit also finished on 50 yard lines (Notre Dame stadium and Ford Field, respectively) so the handstand here was pretty cool. As upset as I was about yesterday’s marathon, I was very happy with the Lincoln marathon. Great people, lots of support, well run race. My hat’s off to these Nebraskans. They know how to pull a marathon off. This one will be remembered as one of the most seamless and enjoyable. A quick drive, lots of food and a long 2 hop flight home followed by a 2 hour drive got me to Misty’s at 11:45 pm. One word to describe this whole darn marathon: Poo. It was hot, humid, and executed by a bunch of amateurs. But I’m getting ahead of myself…. This trip has been planned for several months, and I always knew it was a ‘double’ only 2 weeks after my first 24 hour race. I knew it would be rough, but a worse hand could not have been dealt. There are few cardinal rules in marathoning, but one of the most important is never run in an ‘inaugural’ race. Ever. Ya just don’t do it. No matter what. If you need evidence for it, I submit this race report. Bad moves all over the place. But again, I am getting ahead of myself…. As I follow my state chase, I try hard to save money wherever I can. 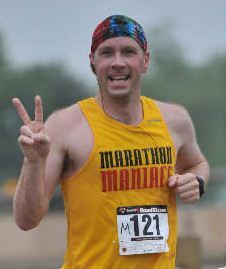 I run ‘doubles’ (two marathons in one weekend) to save money, not prove something. In this case, I flew a triangle flight path, Detroit to Houston, Houston to Omaha, Omaha to Detroit. My weekend began good enough, getting to Houston on Friday afternoon and had a great dinner as a hole in the wall restaurant in Houston with an old friend. The food and conversation were both great. A quick ~1 hour drive to po-dunk (A.K.A. Beaumont) Texas. Packet pickup was chaotic to say the least. With a 5K, half marathon and full marathon and some people pre-registered, some people wanting to register right then and there, you would think they would have signs designating which volunteers had which. Nope. You got 10 lines for 10 volunteers and you didn’t find out until you got to the table that you were in the wrong line. This was a sign of bad thing to come…. Hotel (Thanks Hotwire.com!) was nice and cheap, two things I love in a hotel and I woke up at 5am for my 7:30am race. The race information was pretty crappy, never really telling you where to park,so I got about 0.5 miles away and thought I was OK. Turns out, we ran right by my car during the race. I almost thought about changing socks on the second trip around. With <5min to go, the people at the race start realized that all 1500+ runners were on the wrong side of the start line and told them to go over to the other side. Yeah, THAT was smart. They had not mastered the art of the PA system, and nobody bothered to shepard people in the correct place before the last minute, but OK, I’ll give ‘em that one. One thing outside the race director’s sphere of influence was the weather. It was drizzling and 75 degrees, on its way to 85 degrees and 150% humidity by mile 18. It was blessedly overcast until mile 14 when the sun came out and that was oppressive. Everyone around me was hurting. I ran a 100+ mile race just 2 weeks previous, so I was not 100% by any means. I actually had knee pain and light shin splints going into this race. By mile 3, my shins were absolutely screaming with incredible amounts of pain. One way to prevent shin splints is to (no joke) do some running backwards. It stretches out the correct muscles and actually helps. Many of the miles were on closed off highway so the road was in good condition (read: no potholes) so I did 200 or so meters running backwards. That helped because when I flipped back around, I felt no pain for ~400m, and then the pain came back but slowly. I did that 3 more times and then, and mile 7ish, a miracle happened. My shins, decided that they were in fact fine and all pain went away, never bothering me again all race. I give a lot of credit to a brand new pair of 2XU calf compression guards, which seemed to really help. My knee gave me small cries all day long, but nothing major. Considering how beaten up I was going into this race, I felt pretty damn good. Ok, back to yelling at the race directors…VERY poorly marked course. Some of the race marshals did not even know which was we were supposed to turn at some points. The course had seemingly zillions of turns through town, and some were not even labeled. One the second loop (for us a few marathoners) the field was so thin you could not use that tried and true method of not getting lost by just ‘following the runner in front of you’ because they would sometimes take wrong turns or you couldn’t even see them, they were so far ahead. Ok, last dig. It’s hot, right? It’s humid, right? So that means your sweat is just plain not cooling you off. You are overheating. You would think water is REALLY *&$#%ing important, yeah? The last 7 water stations of the race were dry. Bone dry. No water, no Powerade, nothing. Well, some had some oranges leftover they would give you in the cups meant for water. I saw one aid station getting refilled by some National Guard troops (Thanx guys!) but obviously not enough was done. Everyone I talked to during the race was upset, and wanted to get done and get out of dodge. I could not agree more. The only bright spot of this race was the finishers medal, a nice cool design with a oil well shape. was really cool, gotta give them that.